The Winnipeg Jets have a problem that all 30 other NHL teams wished that they had. Through drafting and trading, the Jets have accrued an enviable stockpile of right-handed defenders and while other clubs are paying big money to secure their own RHD, head coach Paul Maurice and the Jets are struggling to figure out what to do with them all. The newest experiment has pending UFA, Tyler Myers, on the left side of the second defensive pairing. The 6-foot-8 behemoth is playing alongside fellow giant, Dustin Byfuglien and on paper, this is fantastic. Myers had a productive year in 2017-18 when he put up 36 points in a full 82-game schedule, coming on the heels of a tragedy and injury-plagued 2016-17 season. Big Buff, on the other hand, continues to be an NHL star, notching 45 points in 69 games during the 2017-18 season, while laying massive hits and playing the sheriff during some of Winnipeg’s chippier games. In practice, however, this experiment has not been successful. The Jets have one of the most physically imposing lineups in the NHL. Without players like Ryan Reaves, Shea Weber and Milan Lucic, Winnipeg still boasts big, tough players like Adam Lowry, Blake Wheeler, Jacob Trouba and, perhaps someday soon, Brendan Lemieux. A defensive pair of Myers-Byfuglien pits two men weighing well over 200 pounds against opponents who are ripe for the taking but there is an unfortunate downside to Myers’ size. 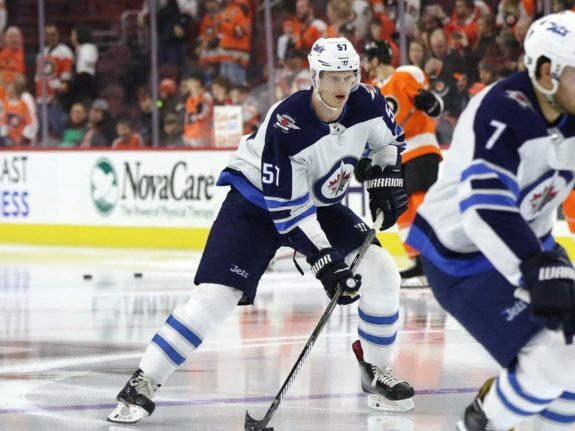 Tyler Myers’ big frame makes the transition to the left near impossible. The reason teams often pair defensemen with opposite handedness together is so their sticks are near the boards. The logic is simple, a player can more easily handle the puck coming around the boards if their blade is facing the puck. A player on their off-side — as the right-handed Myers is when playing the LD position — needs to rotate to catch the puck and then flip it to the inside of their blade. The sequence takes time and when an opposing player is coming at you, time is limited. The rotation is even more important when a defender is back-checking and needs to follow a player when they skate past. On a player’s on-side, their stick can be aimed toward the oncoming attacker to corral them or attempt a stick-check with their free arm available toward the boards to physically engage the opponent. When a player is on their off-side, they need to make a full rotation to get their stick close enough to be effective and their free arm is useless. This is somewhat visible in the following video of Logan Stanley being beat by Jesse Puljujarvi in preseason action. This is where Myers falls flat — and so will Stanley, maybe many times in his NHL career. While smaller defenders like Josh Morrissey, Joe Morrow, or Sami Niku, can make that rotation quickly, the much larger Myers has to rotate his full 6-foot-8 frame. Normally his size would be a boon, allowing him to close off large areas of the ice with his reach and boxing players out of the front of the net, but when he needs to rotate 90 or sometimes 180 degrees, his size becomes a liability. Despite early indications during camp that Maurice would be testing Myers at LD — which would help keep his playing time to 18 minutes per night as he typically plays — recent events have forced the coach to change direction. During Winnipeg’s 5-3 win over the Edmonton Oilers on Sept. 23, Myers began the game paired with Byfuglien but did not finish there. Multiple mistakes forced Maurice to swap Myers with left-handed defender Joe Morrow heading into the third, while Myers was moved to the third pairing. Mike McIntyre of the Winnipeg Free Press asked Maurice if he would continue to try Myers on that side but the Jets coach admitted that he did not know. 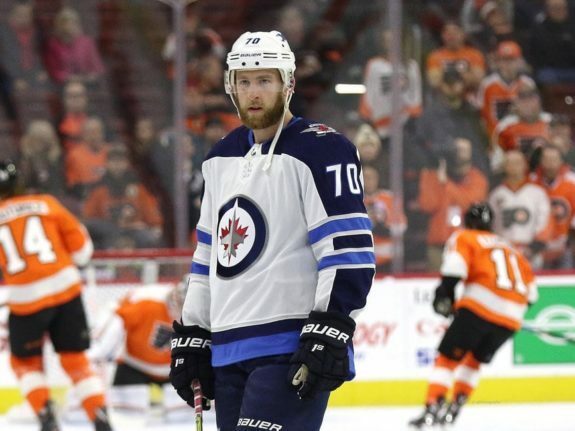 However the next day during practice, Morrow and Byfuglien were again placed together, while Myers skated with Tucker Poolman, an indication that the experiment might be over. FYI, for a second straight day Joe Morrow is paired with Dustin Byfuglien (and they'll play together in Minnesota tonight). Tucker Poolman is skating with Tyler Myers in the non-game group right now. Josh Morrissey back on the ice (after missing yesterday) with Jacob Trouba. Hope is not lost for the Jets, as they have a glut of left-handed defenders to place on the left side. The most consistent throughout the preseason has been Morrow and he could be just the man Maurice needs anchor the second pairing. Morrow has bounced around in his NHL career, a Pittsburgh Penguins draft pick in 2011, he spent time with the Dallas Stars and Boston Bruins before being sent to Winnipeg by the Montreal Canadiens for a fourth-round draft pick. At the time of the trade Morrow had five goals and six assists for the Canadiens, later adding a goal and four assists as Winnipeg’s seventh defender. The 25-year-old has been given every opportunity to succeed in Winnipeg during the preseason, playing alongside Byfuglien and being a defensive force all the way through. He could be a solid option moving forward. Joe Morrow is the LD option Winnipeg is looking for. He isn’t flashy but he gets the job done. He skates well and can move the puck in the offensive zone while being a great shut-down defender that makes a strong first pass in the defensive zone. The Edmonton-born defender is known to be a clutch producer, scoring the game-winner against the Minnesota Wild in Game 1 of their 2018 playoff series, giving Winnipeg their first playoff win in the process. He was fifth among Winnipeg defenders and tenth among all players on the roster in playoff ATOI at 16:37. However, the main draw for Maurice should be Morrow’s handedness and the chemistry he has already built with Byfuglien through the preseason. He is a responsible d-man, with foot speed and defensive awareness who can help make up for the deficiencies in Byfuglien’s game. You also can’t discount his shot; while his newest d-partner can rip it, Morrow is no slouch.